Developing confidence when cooking with yeast allows you to expand your cooking range to some wonderful foods like bagels, pizza, brioche and even doughnuts. Yeast - can be purchased fresh or dehydrated: fresh yeast is often sold in supermarkets (ask at the in-store bakery) specialist food shops and can be ordered from specialist online suppliers. Make sure that you buy baking yeast rather than beer yeast! Fresh yeast can be divided into small portions and frozen for three months. Yeast should always be at room temperature to begin a recipe. Dehydrated or dried yeast - is found in all supermarkets and consists of small granules of yeast in an airtight container. This yeast must be activated with warm water and sugar before you use the resulting frothy liquid in your recipe. The ideal temperature for yeast growth is 27–35 degrees Celsius which ensures that the yeast ‘leavens’ the flour. Leavening makes small air bubbles that are evenly distributed through the bread or dough and give a pleasing texture. If the yeast grows too fast, it makes large air pockets which remain empty or may collapse and give a sunken loaf or cake. If the yeast reaches 40 degrees Celsius it will die. This means that a crucial stage in yeast cookery is the stage of letting your dough rise in a place that has a regulated temperature in the right range. Most kitchens are in the ideal range, but it’s good to keep a thermometer to hand, just to check. Salt - is necessary to producing a good yeast product, but it’s essential to understand how it works. Salt actually inhibits the growth of yeast so if you put yeast in salted water it will remain inert. This means that salt must be added to yeast recipes with care. One point to note is that if you are baking in summer and the dough starts to rise out of control, kneading in a little fine salt can prevent the yeast overgrowing and spoiling the dish. Why add salt at all? Because the process of inhibiting the yeast gives crisper crust and makes the dough more finely grained, as well as adding necessary seasoning. Sugars - are not truly necessary to much yeast cookery, unless it is a sweetened food like brioche, but adding sugar can make even a savoury food more tender because sugar makes the dough rise to a greater volume. You do need to activate dried yeast with sugar and this will be explained in the manufacturer’s instructions. It’s important to know that adding too much sugar slows the growth of yeast (yeast prefers to ‘eat’ sugar rather than carbohydrate, like many of us, so if you give it too much sugar it won’t bother to leaven the flour!) which means the recipe won’t rise properly. A rough guideline is that sugar added to savoury recipes should be about half the quantity of salt, so if you use one teaspoon of salt, use half a teaspoon of sugar or honey. Water - is vital to making a good yeast product. For bread, it’s a rough rule of thumb that 300ml of water per 500g of flour gives dough with a smooth, even texture that is best used for slicing loaves while 350ml per 500g flour provides a softer and more elastic dough that is idea for making flatbreads or soft rolls. 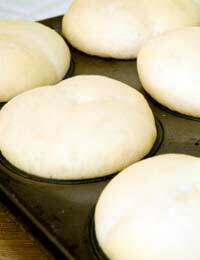 We knead yeast breads to distribute the yeast evenly through the dough, so it rises uniformly. Kneading also helps create a better structure to the finished product by knocking out any big air pockets. Proving is the process of allowing dough to rise before cooking. Knocking back is a second kneading after an hour or so, to remove air pockets again. This is unnecessary if you have proved the dough overnight in a refrigerator. Cooking with yeast usually requires several hours or even an overnight process. While this may seem daunting at first, it’s very simple, as long as you’ve factored in enough time to complete your recipe. As a rule of thumb, assume 30 minutes to activate dried yeast or get fresh yeast to room temperature, ten minutes to mix and knead dough, and an hour and a half to allow dough to rise and be knocked back, then half an hour for cooking. Alternatively you can prove the dough in a refrigerator overnight, then knead, leave for 45 minutes to rise and cook.